For those who find great comfort in peace, quiet, and privacy, this house is not for them. But for those social people who prefer gathering over isolation, and who feel comfortable seeing what family members are doing and saying much of the time, this house may be the perfect ticket. 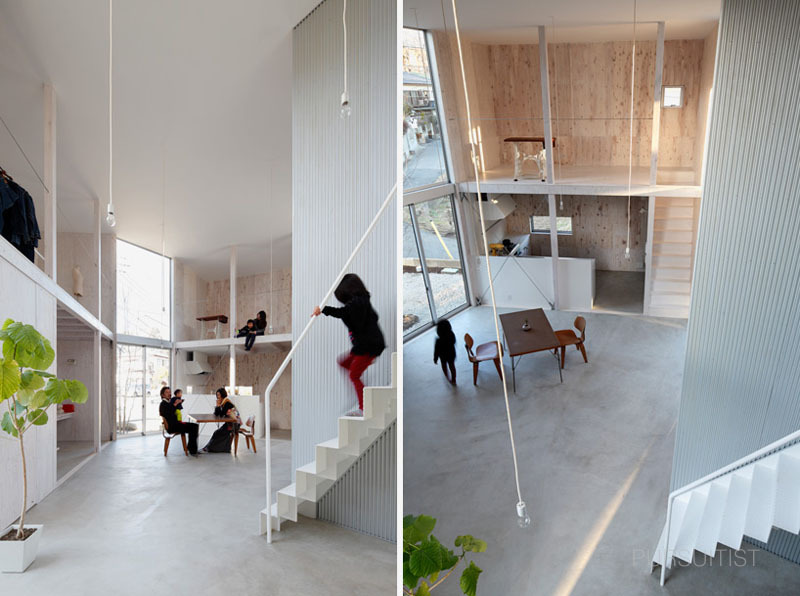 It is called the Unfinished House, in Kashiwa, in the Chiba Prefecture, Japan. 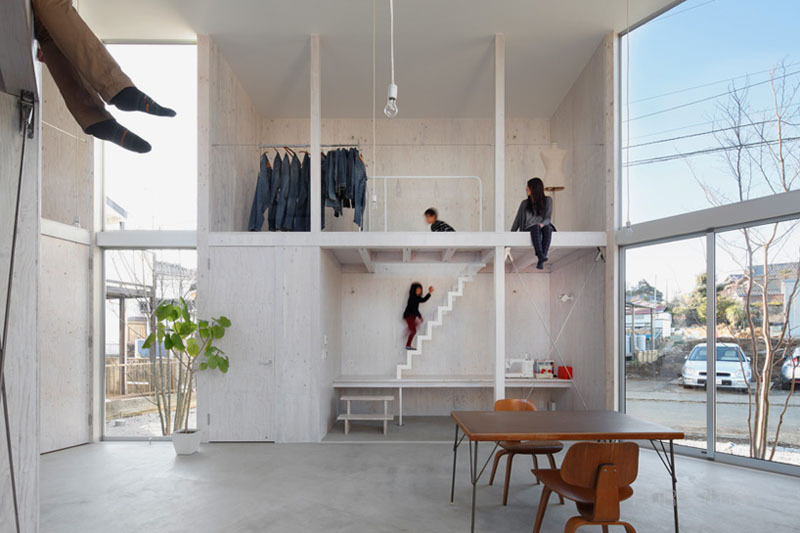 It is architected by a well-known, young (under 40) architect named Yamazaki Kentaro, who said he sees this dwelling as more of a container than an actual house. 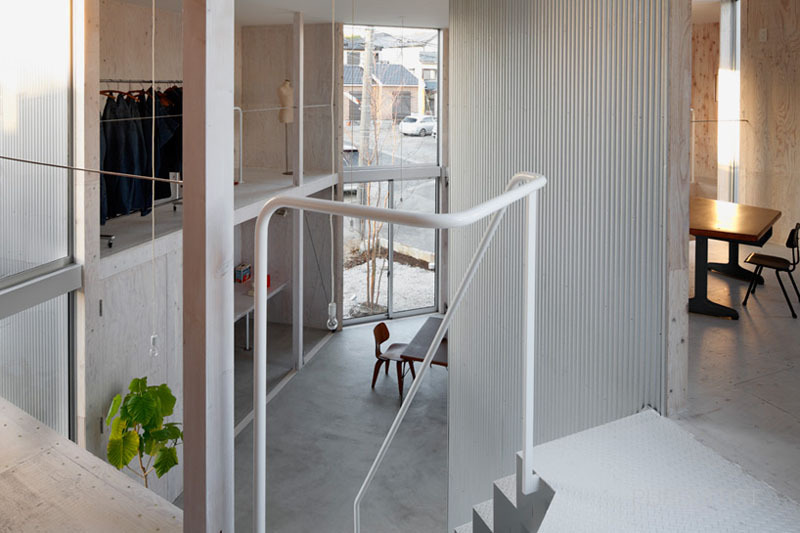 But it is a reflective container, whose interior responds to the needs of its occupants, allowing them to impress their own ways of living and preferences on this sparse design. 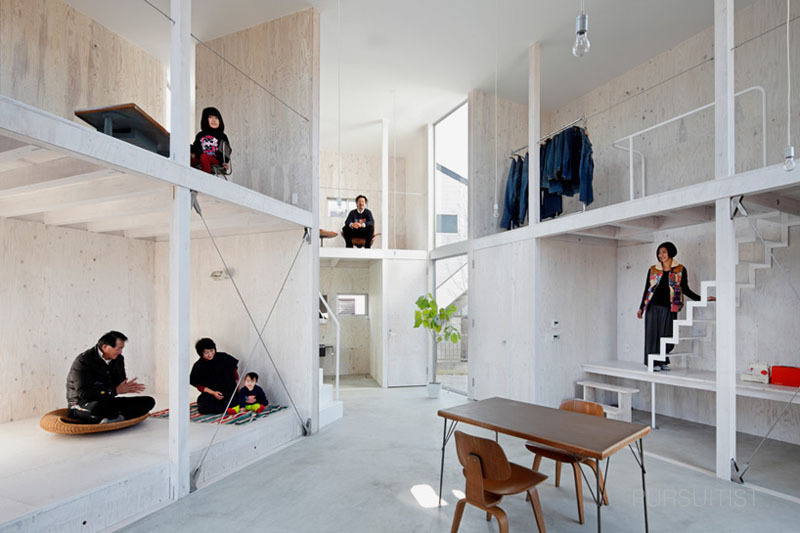 And of course, the initial interior designs change over time, as the resident family grows and changes also. It is an unusual, scalable idea, taking the concept of social growth into a new design essence. The arrangement of the boxes was determined by the views of the surroundings. 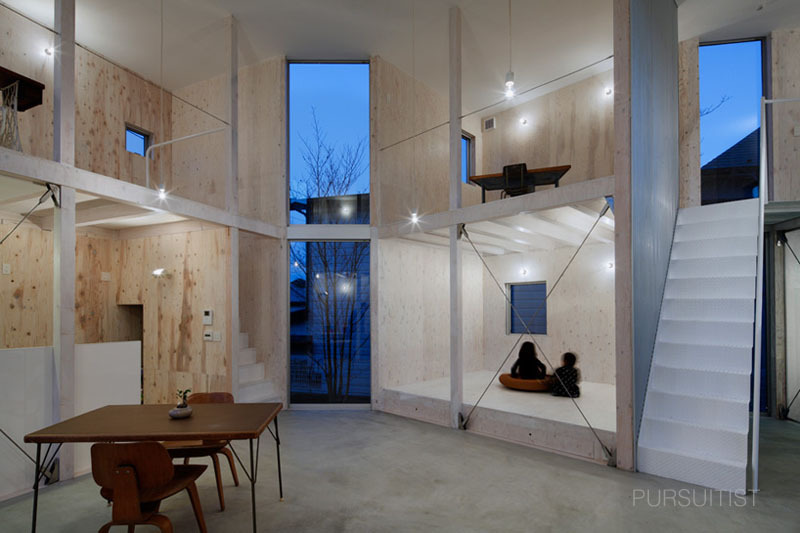 “I positioned the angle of the central space and boxes so that from all windows the view is of trees or the sky, not the neighboring house or their windows,” added Mr. Kentaro. Two of the most important areas are the kitchen and bathroom. The kitchen is located inside one of the boxes, whose door and foyer form the house entrance. This space also offers a view across most of the interior, so parents can see their children, and all others in the vicinity. The bathroom is a semi-private space, three walls enclosed, one wall glass. The exterior of the house is clad with corrugated steel, but inside the walls are lined with bare plywood, with wooden columns. Both create a tabula rasa, a blank canvas, that the residents can design and personalize with their own interests, colors, and possessions. 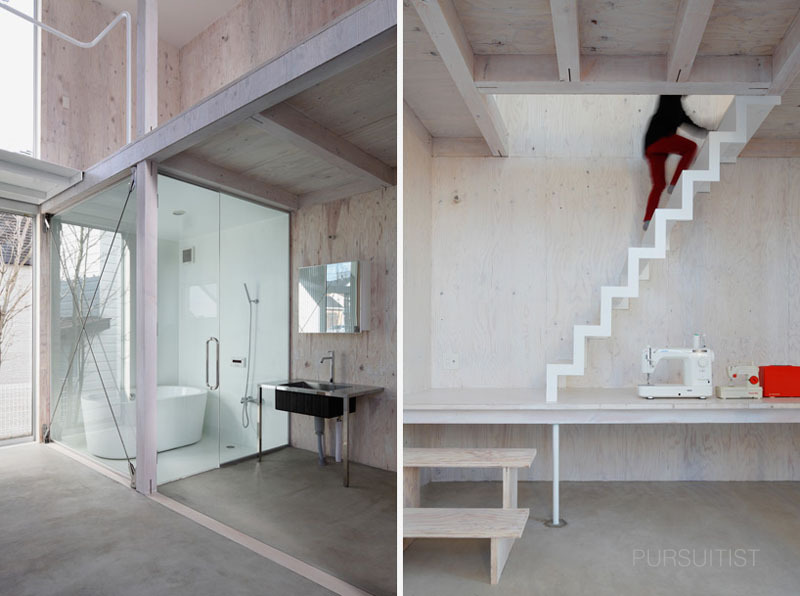 There are many who would have issues with a 700 square foot container for living, with the suggestion that it might not be living at all without some form of privacy; but from a meta-perspective, this design also may allow for more interaction, as the family goes through their developmental stages of growth. The openness of this design, allowing for closer living space, also has the propensity to allow for greater family communication, less secrecy, and more of a sense of community among family members. It is an interesting, though controversial idea, living in an ostensibly wall-less space, almost forcing some form of communication within this living container. With this idea, the meaning of “ unfinished” may also take on a newer dimension. With such a design, the definition of family life is also unfinished, as it grows daily within this exposed, communitarian space. If understood in this way, the home will always be unfinished as it will always be open, ready to allow new growth potential. With the elimination of the many interior walls, families could indeed become more unified and less isolated, and the Unfinished House could indeed become the Finished Sanctuary.